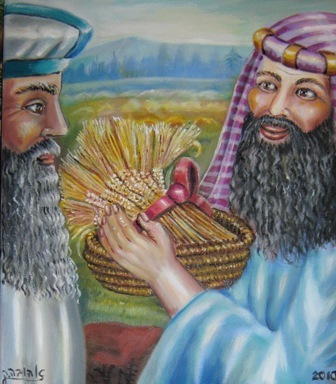 In this weeks parsha we see a very big pattern accrue… so Hashem brings a plague then pharaoh asks for mercy then Moshe goes to daven to Hashem to remove the plague and he does. This sequence repeats itself time and time again almost after every plague. So why does this sequence always happen ?!? Rav yerchem levovitz the games mirrer mashgiach derives a very pasig lesson from this repetition. That there is only ONE way to get something in this world. And that’s through teffilah. now a days when a gadol is sick (or rlly anyone ppl know)... Yeshivos will interrupt a seder to recite tehillim for a speedy recovery. Every morning we say birkas hatorah that lists many mitzvos for which we revive a reward in olam hazeh but the main reward is reserved for olam haba. One of those mitzvos is iyun teffilah. Nevertheless it ends off with saying “ Talmud torah kneged kulam ( torah is equivalent to all of them ). You’d think then that if a person is sick or needs parnassah or has any pressing need his best bet would be to study torah. Rav shimshon pincus actually asked this question. Why do we stop learning to daven for a sick person ? What we learn from this says Rav yeruchem is that although torah is indeed the greatest mitzvah and it carries the greatest reward. But when we need something in this world there is only one way to get it. TEFILLAH!! An example of this is when Moshe rabbeinu saw the Jews worshiping the cheit haagel… did he just sit down to study torah do to teshuvah for them ?!?! NO… he rushed to Hashem to nullify whatever Hashem has decreed upon them. Moshe didn’t run to the bies midrash to learn he ran to daven because that is what brings results in this world !!!! Every arrogant person is an abomination to the Hashem; certainly, he will not go unpunished.) malbim explains that this means Hashem is patient with transgressors he punishes the arrogant immediately and directly hand to hand!! I was being arrogant. And Hashem showed me that!!! because the first thing I thought of was this happened for a reason and I davened that I should find out why… all you have to do is start talking to Hashem start davening then bezrat Hashem you will see you life start to turn around. One last example of this is a story about Rav Moshe Feinstein… he found out one of his grandchildren got sick and was being sent to the hospital… so Rav Moshe closed his gemara and took out a tehillim and began to daven… Rav Moshe headed straight for his tehillim rather than learn Gemara… he knew that tefillah works through a cause and effect…. if you need something in this world you have to daven for it. now is the time to start opening up and to start running to Hashem. Take your chance now and don’t turn around don’t run in a circle. Run straight only going up. What are you waiting for ?!?.... Shabbat Shalom.